Use this report to track incoming call activity to phone numbers including direct calls and those leading from auto attendants, call queues, and ring groups. See aggregate call volume and how calls were handled at every number, regardless of who handled the call or how the call was handled. This report includes all missed and abandoned calls, but excludes all extension-to-extensions calls. You can track the total inbound calls received by a phone number and how many of them were answered. If you are looking for data about who handled the calls, you should check the Extensions Summary dashboard. Let's say that the Sales team at AcmeJets received 40 calls on its main phone number; this is the cumulative sum of all direct calls to this number, as well as calls that were routed via auto attendant, call queues, and ring groups. By Count: Track the call activity (number of answered, abandoned, missed, and abandoned calls) for the selected DIDs. By Time: Track the total time and average time spent (ring time + talk time + wait time + answered + abandoned time) on all inbound calls handled by a DIDDirect Inward Dialing. 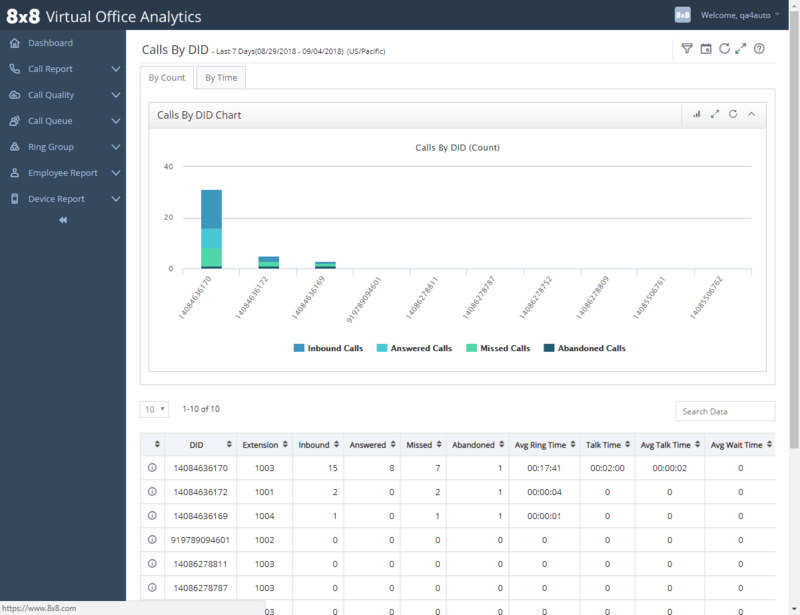 This report tracks incoming call activity to DIDs, including DIDs that lead to auto attendants, call queues, ring groups, and lead to end users from an external phone system. It includes all missed and abandoned calls. But all extension to extensions calls are excluded. DID The direct inward dialing number. Extension Extension number reached by this DID (for example, call queue extension number). Inbound Number of inbound calls received by the DID. Answered Number of inbound calls answered by this DID. Missed Number of calls that were not answered live by this DID (calls that reached voicemail, plus calls that were abandoned). Abandoned Number of incoming calls abandoned by callers before being answered by the DID or before reaching voicemail (Missed calls, minus calls that reached voicemail). Ring Time Cumulative ringing time incoming calls are answered. Avg Ring Time Average ringing time before incoming calls are answered. Talk Time Cumulative duration of the talk time of all successful calls, from the time of connection to termination. This includes time on hold. Avg Talk Time Average duration of the talk time of all successful calls. Wait Time The waiting time before a call is answered or abandoned. This is applicable to queued calls. Avg Wait Time Average duration of the wait time. Answered Time The waiting time before a call is answered by a live person. This is applicable only to queued calls. Avg Answered Time Average waiting time before a call is answered by a live person. This is applicable only to queued calls. Abandoned Time Cumulative duration of all abandoned calls to this DID (all calls where a caller ends the call before being answered). It includes extension-to-extension activity. Avg Abandoned Time The average duration of all abandoned calls to this extension (all calls where caller ends call before being answered). It includes extension-to-extension activity.